Location: Ibis Sofia Airport Hotel is located just 500 m from the Sofia airport. A bus stop is situated a 1-minute walk away. A metro station is 1.6 km away. Megapark, European Trade Center and Arena Armeets are within a 2-minute drive, and the Interexpo Centre is at 5 minutes driving distance. The hotel is opened in August 2014 and it is part of the Ibis hotel chain. 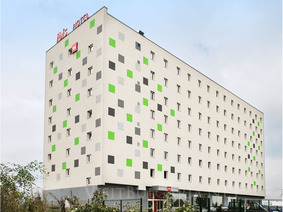 Accommodation: Ibis hotel features 84 rooms. All of them are air-conditioned and soundproof, and come with a flat-screen cable TV, a telephone, working desk, Wi-Fi internet, a bathroom with a shower, hairdryer and free toiletries. Bars and restaurants: There is a restaurant with a summer garden and a bar serving snacks and drinks around the clock. Breakfast is served from 06:30 to 10:00. Facilities: The Sofia Airport Ibis features a business corner, and offices can be rented for a day. Garage parking is available at an additional cost. The hotel offers a free airport shuttle, free Wi-Fi internet and free private parking.